A new memorial to the victims of the Enniskillen bomb has been unveiled during a ceremony to mark the 30th anniversary of the IRA attack in which 11 people were killed and more than 70 injured. 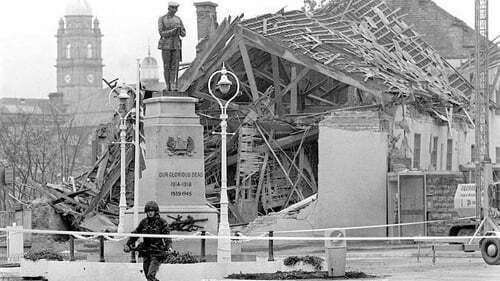 It happened on 8 November 1987 as large crowds gathered for the Remembrance Day ceremony at Enniskillen's cenotaph. A 12th victim died in December 2000 after spending 13 years in a coma due to injuries sustained in the attack. The IRA bomb was planted in a building close to the memorial. When it detonated, the walls collapsed on top of those who had gathered to pay respects to the war dead. Victims' families and local representatives attended the memorial unveiling at the site of the bombing. Politicians and other dignitaries attended, including Northern Ireland Secretary James Brokenshire and PSNI Chief Constable George Hamilton. A memorial service was also held at Enniskillen Presbyterian Church. Another victim of the Troubles was killed the day after the Enniskillen bombing, when loyalist paramilitaries sought to retaliate by shooting a Catholic in west Belfast. Due to mistaken identity, they killed a Protestant student, Adam Lambert. No one has ever been charged or convicted in relation to the Enniskillen bombing. Ten people were arrested in connection with the bombing but no charges were ever brought. Detective Superintendent Ian Harrison, from the PSNI’s Legacy Investigation Branch, said: "The Police Service of Northern Ireland remains committed to pursuing investigative options should they develop in the future." During a recent visit to Belfast, former US president Bill Clinton said the Clinton Centre, a peace-building facility named in his honour and built on the site of the bombing, would receive a major investment towards its activities commemorating those who died.